Open Wednesdays -Sundays at 5 for dinner. Open on Mother's Day with a Grand Champagne Buffet. Next Murder Mystery Dinner Theater Sunday May 26, "MurderTakes a Cruise" Great Fun for all, prizes for the winning detectives! We have plenty of free parking here onsite. Two acres of on site parking with room for hundreds of cars. Abundant Street parking also available. City bus stops on Manitou Avenue close to our location. Parties are welcome to hire musicians, bands or DJ's for their events. We can provide local referrals. Full service on site catering from extensive & diverse preplanned menus or customized to your individual needs & desires. Please call for information & quotes for your event. Planning a Wedding, Anniversary Party, Hail and Farewell, Prom, Birthday Party or a Company Party? Come in, tour the venue to see our beautiful private rooms of all sizes great for small parties and large. Your personal experienced banquet director will guide you through the event planning process making your event a success using one or all of a variety of banquet options. You may choose one or all of nine intimate dining and meeting rooms. 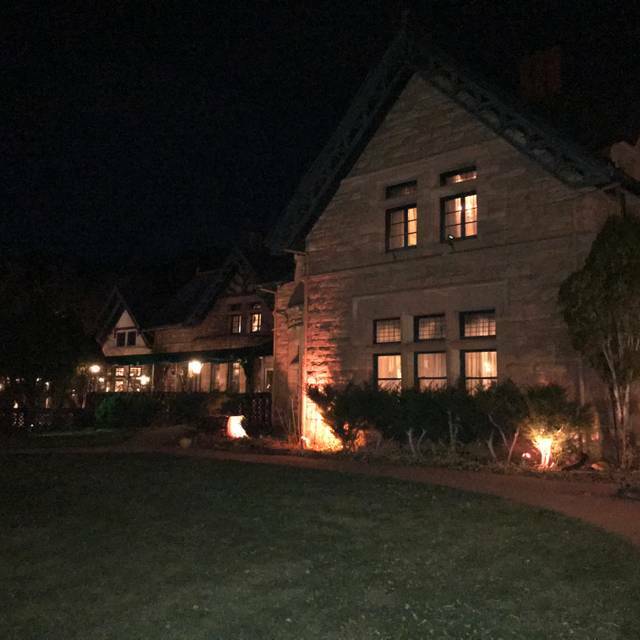 Only a few minutes drive west of Colorado Springs, Briarhurst Manor is located in the tiny valley of Manitou Springs. 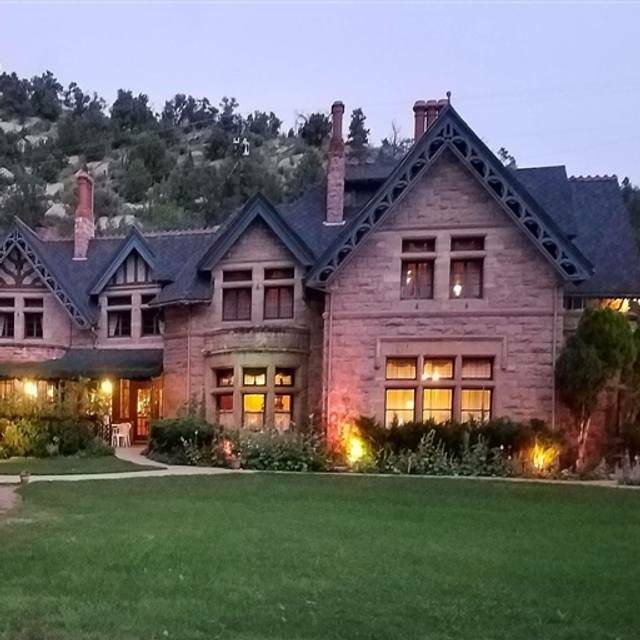 The stately Victorian manor house was built in 1872 by the founder of Manitou Springs, Dr. William Bell of London, England. 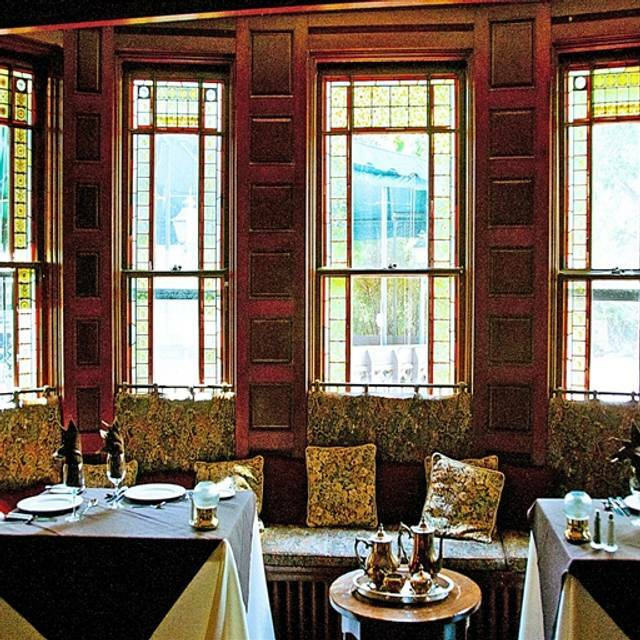 Our restaurant seats up to 500 guests and features casual yet elegant dining in nine intimate rooms, an extensive menu and wine list complete with five course dinners featuring domestic and game meats, fresh seafood, pastas, poultry, specialty salads, vegetarian, and handcrafted desserts. The finely grained pink sandstone Tudor manor displays the architecture and landscaping of an English country house complete with the bubbling Fountain Creek passing through the estate. There is also an unrivaled view of Pike's Peak. It was great customer service. Excellent food and atmosphere. Beautiful and romantic setting. The chef and waitress were amazing. There was nothing we could have asked for that they wouldn't do. Just an overall amazing night. Overall a very good experience and would definitely go back. Amazing evening! Food and service were exceptional. Will go back and take friends! This is one of those places that you don't want to let too many people know that a dining gem is around because you're afraid that the place will get packed and reservations will be hard to get! We had not dined here for a good number of years as we live out of town. We were fortunate to spend an evening in Manitou Springs and said, "Let's go to the Briarwood". Dinner was WONDERFUL! From the graceful manor house to the gentleman who greeted us, Christian who waited on us, the food was INCREDIBLE right along with Christian who gave us his expert advice from cocktails to wine pairing to dinner entree selections and finally, that unbelievable dessert! My husband appreciated the 15 year old scotch instead of the normal 12 year that most restaurants have. It was smoother and more fragrant. The appetizer of escargot melted in your mouth. The salad was a nice fresh take on the usual. The boar and roasted vegetables were so tender and flavorful...yum! The dessert was so decadent that my husband is still talking about it! Just a wonderful, wonderful eating and dining experience! Shhh...don't tell anyone! Our waiter was so kind and attentive! And the food was great, especially the soup & filet! Once again, the preparation and presentation was excellent! The chefs are so confident (And rightly so) in their skills and personal pallete, you will find neither salt nor pepper on your table. If you try your meal as prepared, without adding anything to it, you may be delightfully surprised at how flavorful it is. Excellent service and food. We had an enjoyable evening. The five course meal turns an everyday dinner into a special occasion. The lobster bisque is the best in the city. I had the duck which had a perfect seat, and my wife had the boar which was rich and delicious. I was disappointed we missed the murder mystery night so we’ll have to make sure to keep an eye open for the next one because that sounds like a blast. Food was wonderful, service was great, and the bill was nowhere near as high as I expected. This place was elegant to say the least. The ambiance and faint music while sitting in a cozy nook made the experience all that much more romantic. Our coats were checked at the front. Our server Christian was well versed on the history of the Manor. He also knew everything about the meal and how it is prepared. 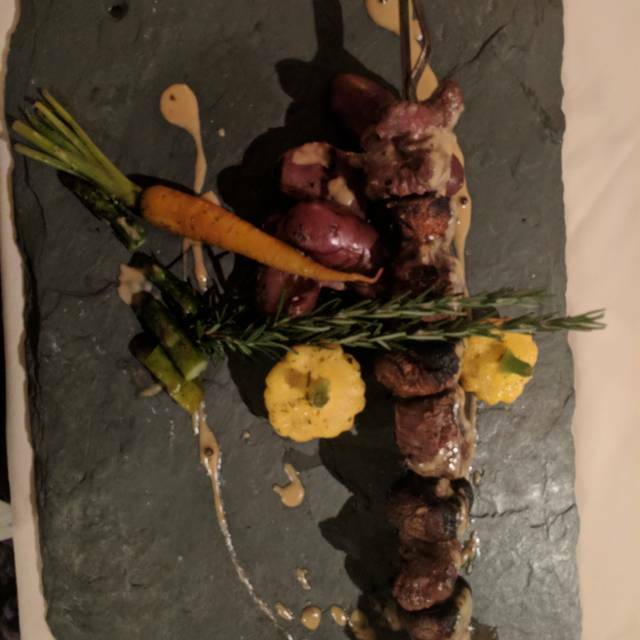 I had the Elk and stuffed sausage. The flavor was acute with every bite. We will be going back for date night more often. Excellent food and ambiance but expect to pay a C note per person if you get drinks and the five course meal. A great spot for that occasional spurge. I will return. The place is really neat, lot of history. We were sat and you could hear a pin drop. People were whispering at their tables because it was so quiet, awkwardly quiet, no music or anything. They finally had a violinist play a few songs, but that only lasted about an hour. My salad was good, the lobster bisque was good, but the entrees and dessert were sub par. The waiter pushed the $18 add on to all of our meals saying it was more cost effective. He was very nice, but service was extremely slow. The tables around us had their orders and drinks messed up the whole time we were there. Not sure if it’s new management, new staff or what, but we paid a lot of money for an awful meal and experience. I heard it wasn’t always this way so hopefully they get their stuff together. Food defiantly just was not worth the money that you pay. This a a very romantic place for a nice quiet dinner. I am not sure what others have said about the dress code but there were plenty of people dressed casually, blue jeans etc. The food was great, the service was amazing and learning the history was cool too. We will definitely eat there again but probably only for special occasions. The price is at the top end. As usual, we were excited about the evening as we have visited the Manor before. As expected, we we greeted warmly and sat in a very quiet corner among several couples enjoying the evening as well. Our server was delightfully attentive so we expected the true Briarhurst hospitality we had experienced several times before. We started with the Bisque, which was and has always, been incredible. 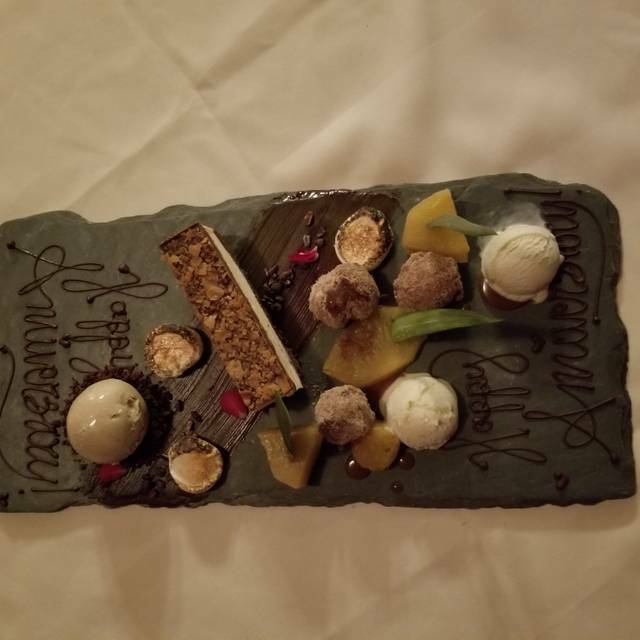 In addition, we ordered the cheese plate as an appetizer, with the Wild Boar and Fillet as entrees, and finishing with the cheesecake and creme brulee. Now, I understand that serving times may have been a little longer due to the occasion and ambiance being portrayed, but they were longer than expected. Up to this point, all is well until we see a couple with a baby being sat by us. Now, don't get us wrong. We have kids and we love to take them out to eat as well but... it's a Special Valentine's Day Dinner specifically advertised for couples. The entire reason for coming to this venue was to have COUPLE time WITHOUT the kids. If I had wanted Family style surroundings for this special day, I'd have gone to Texas Roadhouse! And, for the record, by no means is the couple to be faulted. They were simply looking for a rightfully deserved moment for themselves, as well! However, this changed the mood and celebrating became more of a dash to finish our dinner before having to experience the inevitable natural baby things. 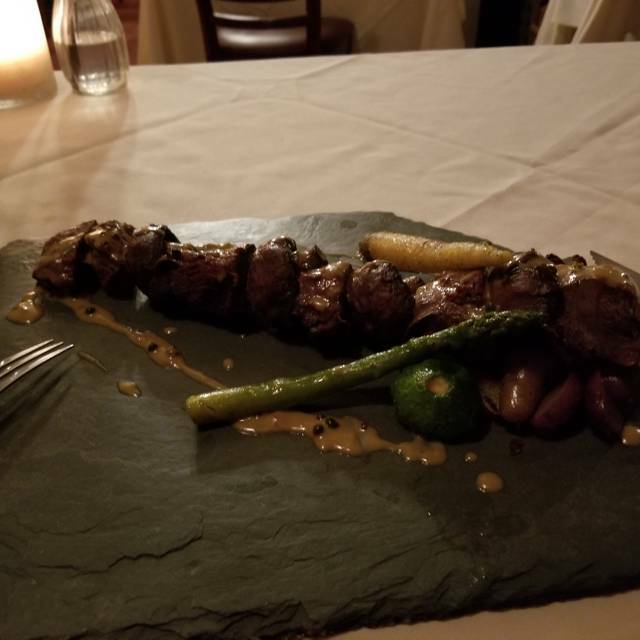 Unfortunately, the fillet was overdone, med-well over the med-rare requested, so the wife and I ate the Boar while we waited. When her dish arrived, the meat was cooked well enough, but the root vegetables were raw. We didn't have much luck with Creme Brulee either as they forgot to fire the candy sugar crust and gave us wet custard instead. When I spoke with Ken Healey, GM, regarding the experience, he did offer to make it up but as we are not in the area, it was not possible. A month later, I'm still waiting for some semblance of an alternate "make it up". We have been coming here for years and this time was horrible! It took 3 hours for us to even get to the 4th course and a table of 4 got their 2nd entree before us who had reservations 30 min after us! Complained to the manager and he gave us excuse after excuse and we asked for our entree and dessert to go! He gave us a discount on the bill which didn't make up for our ruined valentines dinner! The service was great. Food was amazing. People were friendly. Building was fantastic. Probably the best restaurant in town. Finest dining. Beautiful dining rooms. Pretty perfect service. Excellent food in a romantic environment, service, food, and staff was great! Delicious food. The team was even able to work with my Celiac disease and I had a great dining experience. dining room was cold. Was informed that the lobster appetizer was not available at 6:30 pm; restaurant opens at 5:00 pm; then after inquiring with our server, was told that the appetizer could be served for $2.00 extra because the menu’s were changing the next day. I found the bread service to be a joke. The duck entree was wonderful, however the skin on the duck should be crispy not mushy. Had to send it back for further cooking. We have visited Briarhurst Manor a number of times now and have always had a wonderful experience. The restaurant has such amazing character and charm with a number of unique dining rooms. We just love the place. 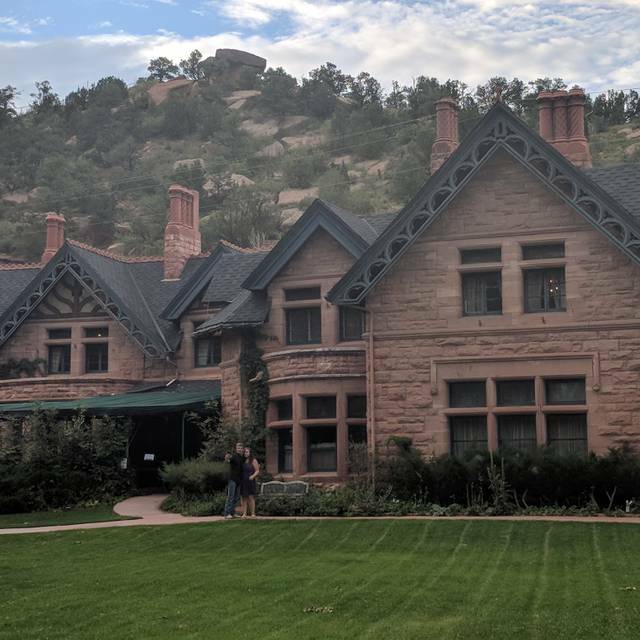 Feels like a little bit of English Manor House tucked into Manitou Springs. Great staff! They are friendly, professional, but not stuffy. We have been coming here for years on our anniversary with the exception of this year everything was great. This year was very unacceptable. My wife’s mushrooms were not washed and she ended up with a mouth full of sand. The Crème brûlée was cold with and the crust was soggy. Overall this was the worst experience we have ever had here. I’m not sure if there has been a change in management or what but if things do t get fixed we will not be returning. We have been here before for special occasions with a Groupon. This time, went for my birthday and decided to get the Steak and Lobster special for $19.95. We decided to do the 5 course, which added $18. Well worth it. Very good food, the steak was rare as asked for, and I recommend the creme brulee for dessert. If you aren't really hungry, just get the Steak and Lobster for $19.95. Plenty of food!! Our waiter was wonderful, attentive and thought of everything. Great place for a romantic evening. We had a wonderful Christmas Eve dinner at Briarhust! We went there for our 25th wedding anniversary because we wanted something extra special. We were not disappointed. The food was excellent, probably the best Wellington I've ever had, and we loved the desserts, especially the s'mores bomb. My husband's filet was also perfect. The service was wonderful, and the ambiance was terrific. We will definitely go back for other special occasions, although it's a little pricey for every day. 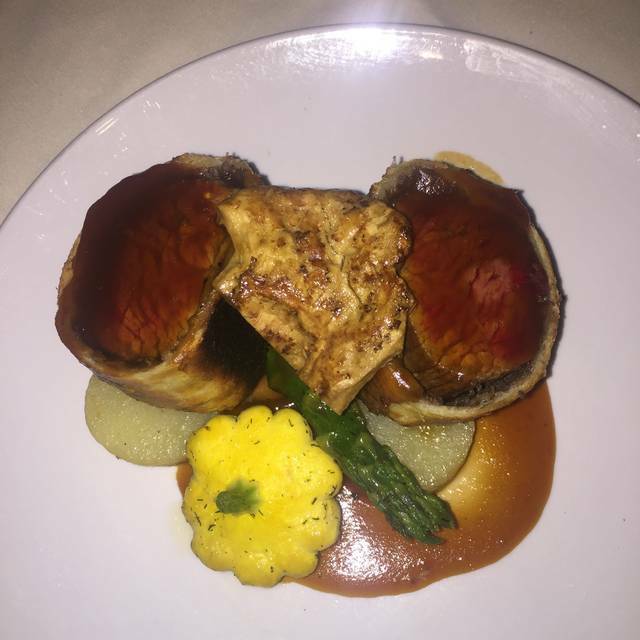 And we would recommend Briarhurst for anyone who wants a memorable meal. Food is very good, although portions are small. The furniture (tables, chairs, etc.) need some attention. Continues to be charming, however without some top to bottom attention, the aging facilities will eventually cancel out the notable ambiance. The Briarhurst hits another grand slam! Everything including the service from Tyler was simply impeccable. Jaime (the head host) has this place humming. The chef is so creative. I hate salmon and he had it in the amuse bouche which I thoroughly enjoyed. The steak Diane was once again incredible and we'll be back for more soon! Great ambiance and service! Food was tasty and provided a fantastic sample of Rocky Mountain cuisine. Food presentation was beautiful and I was really impressed by how healthy many of the dishes were. A perfect place to bring visitors to get a great taste of CO in a gorgeous, unique space. 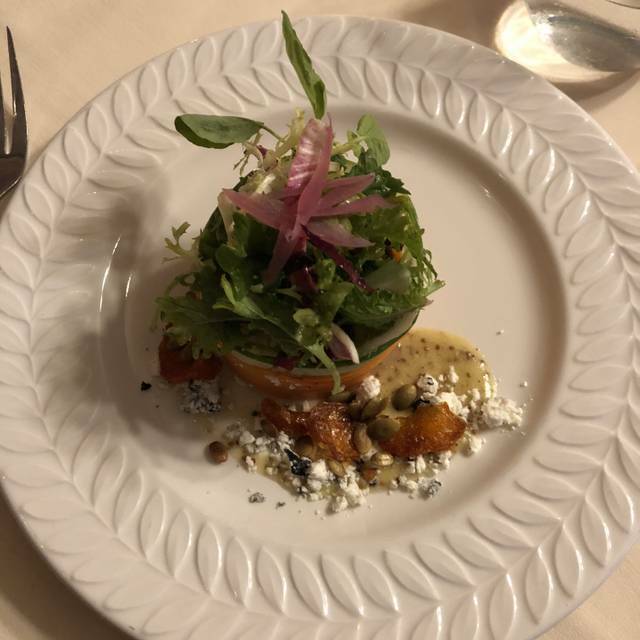 We had a fabulous five course meal at Briarhurst Manor. The presentation of the food was beautiful and the service outstanding. It's a great place for a special occasion or romantic date. I'd highly recommend! Wonderful experience. Great food and atmosphere. We recently moved back to Colorado and the Briarhurst is just as good as it was years ago. The food was fantastic and very wonderful. Our server Corbin was excellent and very knowledgeable about the menu and the wine list. I recommend this restaurant to everyone that is looking for a sophisticated restaurant with an excellent menu, wonderful ambience, and impeccable service. The experience is well worth the cost. I decided to come here Saturday for my boyfriends birthday by the suggestion of a friend. She told me the food was outstanding and it would be perfect for the date. But that was completely wrong, the food was terrible, the waiter was snobby about us not knowing the correct way to place our silverware to indicate we were done eating. The only good thing about this restaurant was the bread. The house special was elk that night and was recromended. It was bland and dry. I was really disappointed after seeing the great reviews. Maybe it was an off night. Never going the spend that much money for the food again.